Andre Lorent set for world premier of their new video on the VinLuxe Wine Aerator. The YouTube video shows the process and the proper way to use a wine aerator. Luxury accessory company Andre Lorent Lifestyles is announcing today’s world premiere of the new video for their VinLuxe Wine Aerator. The VinLuxe Wine Aerator was released to the market during the holiday season and has received 56 five-star reviews on Amazon.com where it is exclusively being sold. The video, which premiers today exclusively on YouTube, explains the design of the VinLuxe Wine Aerator, which holds a global patent for its unique, three step aeration process. 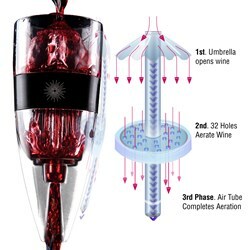 As shown on the video, wine is fully-opened within seconds by passing through first the VinLuxe’s umbrella aerator, then through 32 tiny holes to aerate the wine even further and finally through the aeration filter tube and into the wine glass. The YouTube video which premiers today, shows this process and the proper way to use a wine aerator. “Our video was filmed in a professional film studio in Burbank, California,” says Cummings. He says the initial feedback has been positive. The VinLuxe Wine Aerator has been widely acclaimed in the wine community, with wine lovers praising both the aerator’s efficiency and its excellent results. The video is premiering today on YouTube. Viewers will also be able to take advantage of a special 25% discount code shared at the end of the video. This special code is only available through the video and for a limited time, to mark the video’s premiere.